When a console program needs to obtain information from the user, such as the user's name, it uses gets or perhaps scanf to obtain the desired input. The debug routines included in the PIC32 Starter Kit provide this capability. When the PIC32 board requests input, through the JTAG/USB interface, the host computer brings up a dialog window where the user can enter the requested information. The mechanics of using the MPLAB IDE are described in a separate tutorial. This document is devoted to the code itself. The necessary code files and MPLAB project and workspace files are packaged in hello2.zip. Try out this example. What happens when you enter names with fewer than four characters? What happens when you enter a name with more than 24 characters? Does the program behave the same way with shorter and longer names? 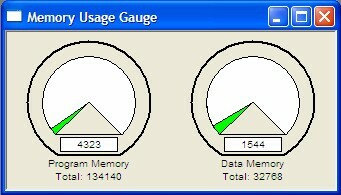 Compare the memory usage for the two programs and fill out the following table. How much data memory is reserved for the static array?